mmsonline.com January 2017 MMS 73 FEATURE tend to occur at the end of the process, he explains. That is, parts emerge from the machine complete, and electrodes stay on their pallets throughout their entire lifetimes. In contrast, work slated for the metal mill often has to be sent outside the shop for heat treatment first, and it is more likely to experience mid-stream engineering changes. Even with sufficient rigidity, that meant taking parts off their pallets and losing all offsets in the process, but no longer. 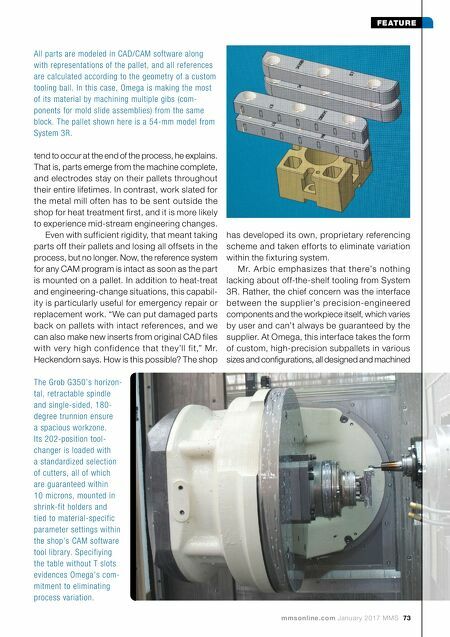 Now, the reference system for any CAM program is intact as soon as the part is mounted on a pallet. In addition to heat-treat and engineering-change situations, this capabil- ity is particularly useful for emergency repair or replacement work. "We can put damaged parts back on pallets with intact references, and we can also make new inserts from original CAD files with ver y high confidence that they'll fit," Mr. Heckendorn says. How is this possible? The shop has developed its own, proprietary referencing scheme and taken efforts to eliminate variation within the fixturing system. 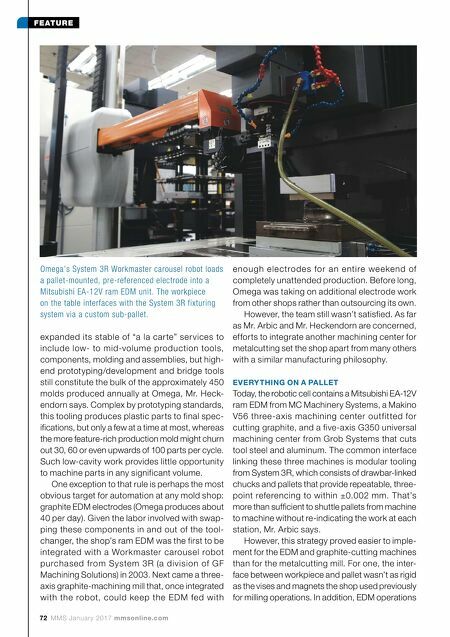 Mr. Arbic emphasizes that there's nothing lacking about off-the-shelf tooling from System 3R. Rather, the chief concern was the interface between the supplier's precision-engineered components and the workpiece itself, which varies by user and can't always be guaranteed by the supplier. At Omega, this interface takes the form of custom, high-precision subpallets in various sizes and configurations, all designed and machined All parts are modeled in CAD/CAM software along with representations of the pallet, and all references are calculated according to the geometry of a custom tooling ball. In this case, Omega is making the most of its material by machining multiple gibs (com- ponents for mold slide assemblies) from the same block. The pallet shown here is a 54-mm model from System 3R. The Grob G350's horizon- tal, retractable spindle and single-sided, 180- degree trunnion ensure a spacious workzone. Its 202-position tool- changer is loaded with a standardized selection of cutters, all of which are guaranteed within 10 microns, mounted in shrink-fit holders and tied to material-specific parameter settings within the shop's CAM software tool library. Specifiying the table without T slots evidences Omega's com- mitment to eliminating process variation.